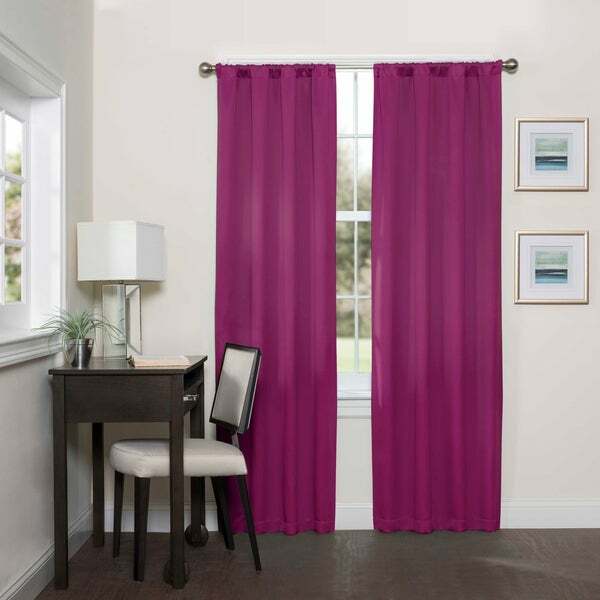 Find the perfect combination of fashion and function with Eclipse Darrell Window Curtain Panel. Eclipse offers a complete line of functional curtains that provide privacy, manage light, reduce noise, and help with energy savings, without sacrificing the latest looks in window fashion. This beautiful panel offers light blocking benefits and features a soft, solid fabric. Special light blocking yarns are intricately woven into the panel giving it a rich hand and luxurious drapability. Panel measures 37 inches wide. 3 inch rod pocket is recommended with a 1.5 inch rod for maximum movement. Curtain rod sold separately. 100% Polyester, unlined panel. Machine washable. Dimensions 37.0 In. X 95.0 In. X 0.25 In. Theses curtains were beautiful. But..... Blackout.? They didn't do the job. If it wasn't for my blinds and window panels, the room would have been light. I know I would have gotten better results from ordering Drapes with thick backing. I bought these curtains because I work late shift & had a problem sleeping in day time. These failed to darken my bedroom enough. I will keep them for another room because they are beautiful. I bought the color Natural. the package came sooner than expected. thumbs up to overstock. I love these curtains. They are truly block-out curtains. I placed them in my 2nd floor bathroom for privacy. just beautiful. This curtain was perfect for my sons room. It did a great job blocking the sunlight which helped my son sleep & kept the room cooler in temperature, when needed. The dark green matched his bed set. It is a lighter curtain so there's not a lot of strain on the already existing rod. I would definitely recommend this! They are so beautiful! I love the green color because it's so rare to find! I've searched for years for a color other than sage! This is so much better! Arrived early! But doesn't block out the light like advertised. I sleep during the day and work at nite. I'm going to have to put something on top or below it to stop the light. Very disappointed. I purchased these to use as a backdrop for my Christmas tree. The chili cover is the perfect shade of red. It looks fabulous. And being on sale it was a great deal. Can't go wrong with these. Great room darkening and looks lovely with the flower/butterfly bedspread Overstock sells. These are a perfect magenta, no purplish hue.